A lovely light gluten-free cheesecake with a creamy lemon filling, an amaretti biscuit base and a hefty dose of amaretto liqueur. With only a handful of ingredients, it's a fuss-free gluten-free dessert that everyone can enjoy. Preheat the oven to 180C/160C Fan/ Gas 4. Grease a 24cm/9?in springform cake tin with a little butter on the base and all around the sides. Put the amaretti biscuits into a food processor and blend into fine crumbs. (If you don’t have a food processor, put the biscuits into a strong plastic bag and crush with a rolling pin instead.) Sprinkle the amaretti biscuits on the bottom and the sides of the cake tin, tilting and shaking to get an even coating. Reserve some of the crumbs to sprinkle on the top of the finished cheesecake. Drain the ricotta cheese and put into a mixing bowl with the sugar. Using electric beaters, whisk until well combined. Gradually add the eggs, one at a time, whisking well between each addition. Stir in the cream, lemon zest and the amaretto liqueur. The mixture should be very soft and light. Pour the cheese mixture slowly into the prepared tin, starting in the middle to avoid disturbing the crumbs. Put on a baking tray and bake in the centre of the oven for 10 minutes. 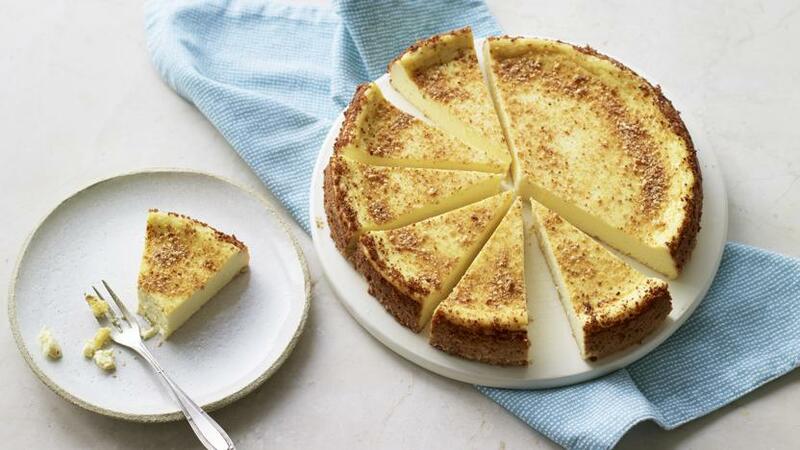 Reduce the oven temperature to 160C/140C Fan/Gas 3 and cook for 1 hour, or until the cheesecake is just set. Do not allow to over-brown. If the cheesecake does start to brown while it is still very wobbly, cover the tin loosely with a large piece of foil. When the cheesecake is ready, turn the oven off and open the door slightly. Wedge a folded tea towel or wooden spoon in the door to keep it ajar and leave the cheesecake to cool completely. This will take 3–4 hours and should prevent the top from cracking. When the cake is completely cool, transfer to the fridge and chill for at least 2 hours before removing from the tin. Slide a knife around the cheesecake, taking care to retain as much of the crumb as possible, and release gently from the tin. Slide carefully off the tin base onto a serving plate and sprinkle the top with the reserved amaretti crumbs. Serve in wedges.